CONCORD, N.C. -- It was only a matter of when, not if, Kyle Busch would find his way back to victory lane. 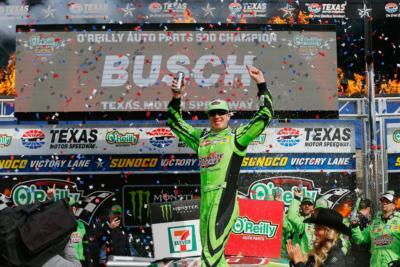 Rowdy "finally" snapped his nine-race winless drought at Texas Motor Speedway, winning the O'Reilly Auto Parts 500. 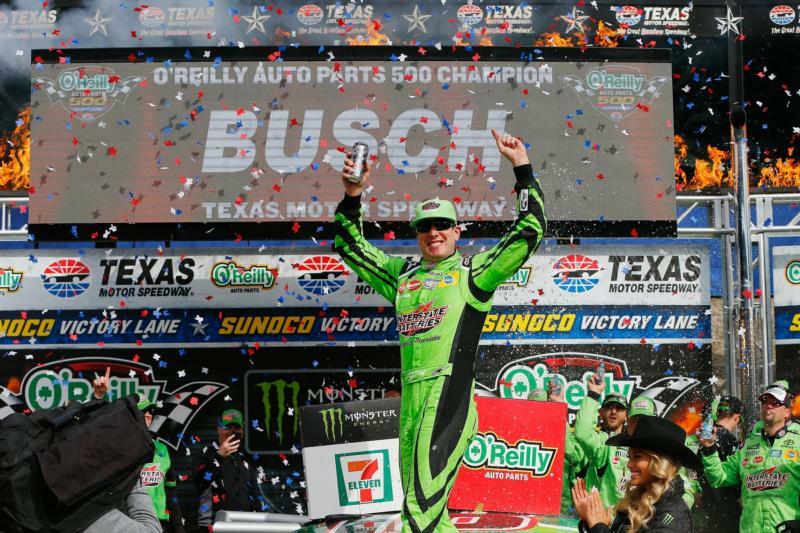 Busch held off a hard-charging Kevin Harvick in the closing laps to earn his 44th career victory in NASCAR's top series, and third at TMS. Busch led four times for 116 circuits, including the final 30 to score the victory, which tied him with NASCAR Hall of Famer Bill Elliott for 16th all-time in the Cup Series. The win was Busch's 185th across NASCAR's top three series. "It feels awesome," Busch said. "Any time you can win at a track that kind of isn't maybe one of your favorites or isn't one of your best, then it definitely means even more because it just — you try to focus on those tracks and make it a little bit more meaningful and a little bit more special to get it done." How Busch won: Busch took advantage of new teammate Erik Jones on a restart on lap 241, racing to the lead and never looking back. The only time Busch lost the top spot the rest of the way was during green-flag pit stops before Ryan Newman pounded the Turn 1 wall with a flat tire with 31 laps remaining. Despite having 13-lap older tires, Busch and Harvick drove away from the field to battle for the win, with Busch keeping Harvick at bay to take the checkered flag. Pit Gun Problems Persist: Despite an action-packed 500 miles at Texas, the discussion after the race again focused on the NASCAR-issued pit guns in the Cup Series. Harvick was extremely vocal in his displeasure, calling the guns pathetic after his team at least one loose wheel, as well as a penalty late in the race for too many men over the wall when a crew member fell trying to retrieve a loose tire. "We did overcome a lot. That was unfortunate," Harvick said. "We had a pathetic day on pit road, two days on pit road because of pit guns. When you have a pit gun problem like we have multiple times and been able to overcome it and then today we couldn't overcome it. "Time after time you can't get the lug nuts tight because the pit guns don't work. The pathetic part about the whole thing is the pit guns. The pit guns have been absolutely horrible all year...It's embarrassing for the sport." Team owner Joe Gibbs sided with Harvick after the race, telling reporters he's "taken a stand" against the NASCAR-issued guns. Cole Pearn, crew chief for Martin Truex Jr., tweeted after the race that Harvick was right, but the Race Team Alliance was getting what they asked for. Inconsistent enforcement: Speaking of Harvick, the driver of the No. 4 was on the fortunate end of a judgment call during his final pit stop. As his team worked on the right-side tires, it looked as though Harvick's right rear was, by rule, out of reach, and thus, "uncontrolled." NASCAR chose to swallow the whistle, allowing Harvick to stay in second in pursuit of Kyle Busch. The reason this was notable is that Ryan Blaney was penalized for a similar infraction early in Sunday's race, with a tire that appeared to be much closer to controlled than Harvick's. A number of fans and media members questioned NASCAR's ruling. Following the race, NASCAR Senior Vice President Scott Miller admitted that race control missed the call. "It was a judgment call, and after conducting a post-race review of the incident, an uncontrolled tire penalty for the 4 car would have been correct. We missed that call," Miller said in a statement. Truex's Trouble: Coming into Sunday's O'Reilly Auto Parts 500, Martin Truex Jr. looked poised to flex his 1.5-mile muscle. Dating back to last season, Truex's last 13 finishes at 1.5-mile ovals were: 4th, 5th, 1st, 2nd, 1st, 1st, 1st, 1st, 3rd, 1st, 8th, 1st, and 8th. With three laps left in Stage 1, Truex's right front exploded in Turn 4, sending the No. 78 into the frontstretch wall, ending his day early. It was Truex's first DNF since Talladega last fall, relegating him to a 37th-place result. Texas-sized Big One: They say everything's bigger than Texas. Apparently, the crashes are, too. On the first lap of the final stage, Kyle Busch pulled off a great save exiting Turn 2, causing the field to accordion behind his No. 18. Entering Turn 3, Aric Almirola found himself in the middle of a three-wide scenario with Jamie McMurray darting to the inside for position. When Denny Hamlin attempted to follow McMurray, he got loose on the bottom and triggered a huge pileup. Involved in the crash were seven-time Texas winner Jimmie Johnson, Almirola, Brad Keselowski, Trevor Bayne, Austin Dillon and David Ragan. The crash was another poor result for Johnson, who is now mired in 20th in points after the O'Reilly Auto Parts 500. Every (under)dog has his day: With several pre-race favorites running into trouble at TMS, a number of drivers in need of a good run seized the moment, including Bubba Wallace. Wallace set the NASCAR world on fire with his runner-up finish in the Daytona 500. In the five weeks since, things cooled down significantly for the driver of Richard Petty's famous No. 43. That is, until a trip to No Limits, Texas. Wallace ran in the top 15 throughout the day, including a spirited battle with Kevin Harvick for the lucky dog in the race's final stage. Using pit strategy to his advantage on a well-timed caution, Wallace found himself in second with 30 to go. Wallace brought the Click n' Close Chevy home in eighth. While we're at it, let's give a tip of the cap to fellow rookie William Byron, who scored his first-career top 10 with a 10th-place finish. Byron held onto the lead lap almost all day and carrying the Hendrick Motorsports banner at TMS. Wind tunnel time: NASCAR announced after the race they would be taking two cars from each manufacturer to a wind tunnel for testing this week. Included were the machines of Kevin Harvick, Joey Logano, Chase Elliott, Jamie McMurray, Kyle Busch and Erik Jones. NASCAR has routinely taken cars to the wind tunnel for testing in the past just to get an idea of where each manufacturer stands in relation to the others. Social Media Spotlight: As is the tradition at Speedway Motorsports facilities, the winner was treated to a champagne toast in The Speedway Club. But Sunday's toast to Kyle Busch was unlike any other, as a young 8-year-old fan asked Kyle Busch why so many fans boo him. Busch took it in stride, saying "people don't like a winner." Whether you love him or hate him, there's no question NASCAR's better sport thanks to Kyle Busch. Bloomin' Monday: Thanks to Kevin Harvick's second-place finish at Texas, NASCAR fans will once again cash in at Outback Steakhouse. Race on in Monday, April 9, for a free Bloomin' Onion. Since joining forces with Harvick in 2014, Outback has celebrated 103 Bloomin' Mondays, including this week! Next week: The NASCAR circus heads to Thunder Valley for the Food City 500 and Fitzgerald Glider Kits 300 in the Xfinity Series. The Performance Racing Network will have live flag-to-flag coverage of all the action at Bristol Motor Speedway as the stock car world slams fenders for 500 laps on the high-banked half mile!